If Brooklyn Nine-Nine's third season felt sort of like a peak period, the fourth season started off in a rather odd manner. It wasn't bad but it was certainly something different. I really wanted to dive into things and embrace but something just didn't quite work and so things dragged a bit and it took me some time before I finally finished watching the rest of this season. For one reason or another things just weren't flowing the way I would have liked in terms of the comedy and so my interested waned somewhat. Again it's still not a bad show and it has a lot of great moments but it just didn't feel quite as stellar as it could be - especially based on past "performance" in a manner of speaking. This does get me wondering if the show has really it its peak and that the writing is starting to get tired. Or maybe ithas just become a bit too familiar and my brain wants to move on to other comedy fare. A show can only go on for so long without major innovation. And to be fair this season started off with a significant attempt at shaking things up. 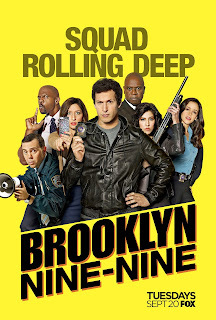 Synopsis: Brooklyn Nine-Nine is an American comedy television series created by Dan Goor and Michael Schur. As of the time of this blog post the show has an on-going fifth season. After the events of the third season, we now follow Detective Jake Peralta (Andy Samberg) and Captain Raymond Holt (Andre Brauger) under witness protection in Florida with U.S. Marshall Karen Haas (Maya Rudolph) as their primary conduct. They're doing their best to get through things and fit into civilian life. But of course it turns out that Jake had rented a storage unit precisely so he could have a private placce to continue working the case that got them put into witness protection to begin with. Meanwhile in New York the 9-9 is under non-leadership of Captain C.J. Stently (Ken Marino). He's clearly underqualified to hold the rank of Captain and ends up giving everyone at the precinct whatever they want just to keep them happy and to avoid being questioned further about his leadership. How long the precinct is going to survive like this is anyone's guess. What I Liked: The three-part "Coral Palms" arc that opened the season was a clever and daring move that had the 9-9 out of their comfort zones in a variety of manners. You had Jake and Holt trying to "normal" and everyone else trying to be more responsible under C.J. Of course their natural tendencies win out and you get some pretty crazy resolutions to things by the end of the arc. The latter part of the season ties more and more to the possbility of some dirty cops operating in the city and this was a genuinely intereting idea. It wasn't quite implemented consistently well across the episodes but there were a lot of great moments part of this story and how things ultimately ended. It at least sets up an interesting premise to begin the next season. What Could Have Been Better: That said, the big arcs were weakened by some odd, off-tangent episodic moments that took away from the overall narrative. The best of example of this was the totally unnecessary crossover episode with New Girl, this being "The Night Shift". It was amusing to see the New Girl crew in New York with the 9-9 but it didn't really become something great for either show. And it felt like their leadership seriously stepping in just to get better mileage. The addition of Captain C.J. was sort of funny in the beginning and worked during the inital Coral Palms arc but I got really tired of his character soon enough. I thinkhe was okay for a surprise change of pace but not as a more regularly recurring character, especially one who got a few episodes dedicated to this plot development. It just didn't quite work for me. TL;DR: The fourth season of Brooklyn Nine-Nine still has great moments and tries to built on the somewhat meta-narrative established in the third season with new story hooks and longer-running story arcs in this season. Now all episodes are a home run but on the whole it's still solid entertainment. And so this season gets a good 3.5 crazy moments with Detective Rosa Diaz (Stephanie Beatriz) and Adrian Pimento (Jason Mantzoukas) out of 5.